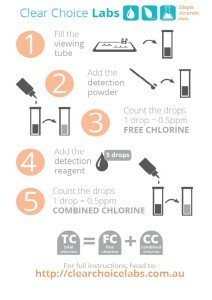 Separate testing for free chlorine and combined chloramines (together making total chlorine) not only helps you maintain a healthy pool, it helps you control your chemical costs by making sure you add only what your pool actually requires. 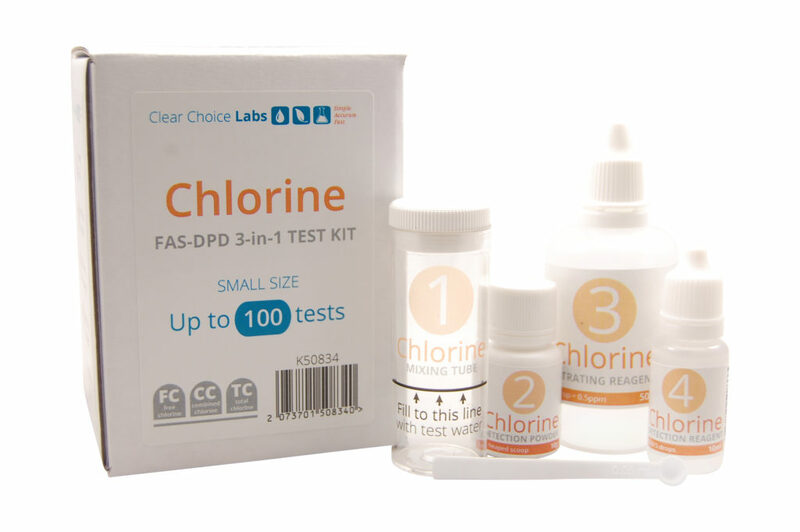 These are the extended instructions for the FAS-DPD 3 in 1 Kits, that give you all the details on how to test your pool for chlorine levels. The instructions on the sides of the kit are simplified reminders of the procedure for advanced users (see image below). Follow the straight forward directions below, and I promise that you’ll be testing like a pro in no time. Rinse the chlorine viewing tube with pool water. If you rinse with tap water, the residual chlorine could interfere with your tests. Fill the chlorine viewing tube to the mark indicated. Using the small spoon provided, add one heaped spoonful of chlorine detection powder. If the sample flashes pink for a moment but then returns to clear, or if the sample turns brown, add another spoonful. Replace the lid on the powder immediately to extend the life of your kit. Make sure that the reagent is thoroughly mixed. Occasionally, some parts may not dissolve, especially if the reagent is older. This should not be a problem. One drop at a time, add the chlorine titrating reagent. Mix between each drop, and count the total number of drops added until the colour changes to clear. The colour may be very faint, so make sure that it is completely clear. If unsure, add one more drop – if there are no more changes, don’t count the extra drop. 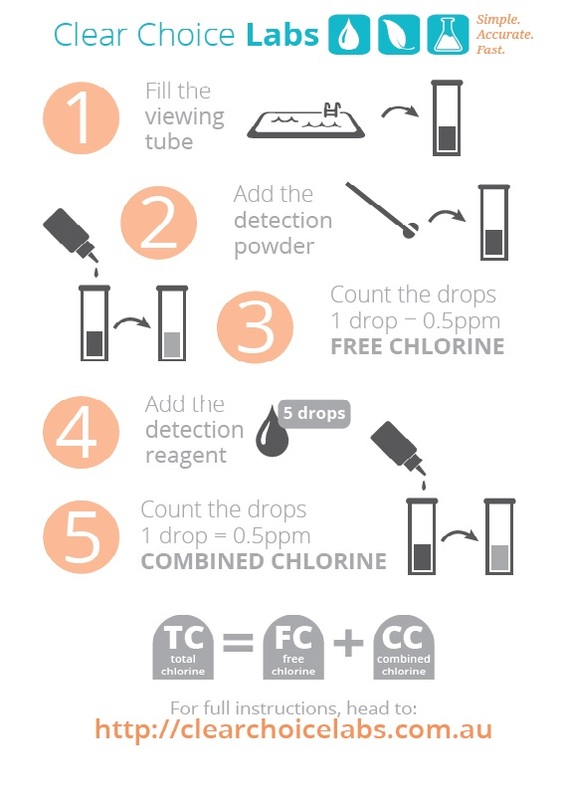 Divide the number of drops by 2 to get your free chlorine level in parts per million (ppm). Add five drops of chlorine detection reagent and mix well. If the sample remains clear, your combined chloramine level is zero. Replace the lid on the reagent immediately to extend the life of your kit. If the sample turns pink again, add one drop at a time of chlorine titrating reagent, as per step 5. Count the number of drops until the sample is clear again. Replace the lid on the reagent immediately to extend the life of your kit. Divide the number of drops by 2 to get your combined chloramine level in parts per million (ppm). This entry was posted in Instructions and tagged CC, chlorine, FC, TC, testing, the basics. Getting slowly used to testing and using the kit. I’m having touble getting a heaped spoon of detetion power on the spoon, it either ends up being a level spoon or the whole end of the spoon and shaft are heped up with powder. So, I assume that two level spoons is just as good, is that right? Secondly, what the the implications of using too little or too much powder in terms of results please? The amount of detection powder is not actually that critical, as long as the solution turns pink. Ideally, we aim for 100mg for a 10mL sample, but the exact amount is not too critical. A level scoop will, on average, be around 70mg. A heaped scoop should have about half the amount of the level scoop again. If you don’t have enough powder, the DPD may be bleached out (ie. the solution won’t turn pink and stay pink). If you use two level scoops (140mg), your biggest disadvantage will be that you will use more powder than you really need to, but it will not affect the test at all. Hello, How does the test react when the powder has gone out of date? Im not gettting a reading of chlorine levels, the water stays clear or goes a bit dirty before going clear again. I have been putting chlorine in, and all my other levels are good. As the powder ages, often it will lose the colouring in the water just as you’re describing. So the water will look “dirty” or take on a grey tinge, and sometimes the powder won’t even dissolve fully. We have some old bottles here from our original batches which we’ve kept to see how they age and they consistently turn the water a slight grey colour once they’re past their useful lifespan. Hello, can you advise a way to do a lower sensitivity test that uses less of the test drops? Is it as simple as halving the water sample volume then counting 1ppm/drop ? This would really help to prolong my reagents when I’m testing at very high (shock) levels of chlorine. Thanks. Unfortunately halving the sample volume won’t have the effect you’re after. There’s a lot of balance between the sample size, drop size, and the concentration of chemicals delivered as well as a host of other things. Even if we could balance those things out, I feel like the potential drop in accuracy wouldn’t be worth the cost savings. I certainly wouldn’t want to recommend anything without testing it myself in depth.